To Whom or What is Your First Loyalty? To whom or what is your first loyalty? That should be an easy question for any serious, genuine Christian. That is, it is easy to answer and to assent to in the mind. But when I ask to whom or what your true loyalty is to, I mean, by the way you live: by what your conversation centers around, by the people you associate with, by the type of things you read and watch, and so on. What is your heart fixed on daily? What is most important to you? Your actions speak louder than your words. I will not go into too much detail in this post, though I do want to write extensively on the subject of idolatry one day. This is a very busy season of my life. But I do want to warn both Kinists and anti-Kinists alike of the dangers of putting something of higher value than the value we place upon the Lord Jesus Christ and his kingdom, and his glorification on the earth. I went into a lot of detail on similar subjects (though not exactly the same) on tribaltheocrat.com (under the name Hans Gygax) about the stumblingblocks Kinists have run into. But I want us to consider this subject again. I myself am revisiting the subject in my mind because I have the tendency to go astray like anyone else. This post is, in a way, born out of frustration. After reading an article about something the other day, I was reminded about the website reddit.com as a way to get a little bit of exposure for my blog. So I went straight to the "Christian" sub-reddit. I found out soon enough that there were not really any Christians there; well, a few pretending ones. I suppose there could have been a needle somewhere in that haystack, though. I mean, you could not hold a legitimate Biblical belief without being attacked! Anything that went against Cultural Marxism was shouted down with violence. Perhaps the place is taken over by paid Jewish trolls? So then I moved to the "Real Christian" sub-reddit and posted a less controversial topic, without really any response at all. Then I found a "Reformed" sub-reddit. Right up my alley, right? I post an article that has nothing to do with Kinism and am immediately greeted by the anti-Kinism police force/watchdog group commanders. I am told about how evil Kinism is and the people on the forum tell everyone to not listen to anything I say. There was no reasoning with any of them there. No graciousness, no charity, no giving your brother the benefit of the doubt. No, not a chance. As a Kinist, I guess I am the equivalent of the worst serial killer in history times a million. These people do not even want to try to understand our position and show any honor or respect. I guess we Kinists have built ourselves quite the reputation, especially in the Reformed community, since most of us [Kinsts] hold to Reformed views of scripture. On the other side of the coin, I was over at faithandheritage.com reading David Opperman's excellent article refuting Brian Schwertley (It is actually a 5 part series), and I had a not-so-pleasant interaction with who I assumed is a Kinist. I had mentioned how we ought to pray for brother Schwertley, but the other commenter boldly and proudly proclaimed how he would not pray for or bless our brother in Christ. This professing Christian believes that he loves God, yet does not love his brother (1John 4:20). So you can see how both sides have made me their enemy. I rebuked this man for not loving his brother and it was not well received at all. I suspect that most Kinists do not hold me in high regard, though I love them dearly. But I would like to share a lesson I learned, as insignificant as it might sound. Despite the hatred showed toward me, God gave me the grace to respond kindly for the most part, and to bless rather than curse. I do not believe I did so perfectly, but in the past I would have responded to them much differently. I thank God through our Lord Jesus Christ for that. I want us to remember that the most important thing, the essential heart desire that we ought to have, is to see the Lord Jesus Christ glorified on the earth, and to "know him, and the power of his resurrection, and the fellowship of his sufferings"(Philippians 3:10). When we are slandered, called names, belittled, and our name cast out as evil, separated from others' company (Luke 6:22), it is easy to just go run over to the anti-Christ White Nationalists for fellowship and support. And God, in his mercy, has blessed us with a very special friendship to a brother in the church, whom we have found out has Kinist leanings. That is a bonus to us; yet our friendship with this brother and his family is around Christ, and around the things that God loves, and the principles of the word of God. Kinship is a part of that, yes, but we have learned you can also enjoy sweet kinship fellowship with others even if they do not openly acknowledge what we ascribe to as Kinists. Practically all of our close fellowship at church is with families that are of German/Irish heritage as we are. God has instilled in people groups an automatic leaning toward our own people and this is wonderful to see. The German/Irish of the congregation best mesh together in spirit with their own people! Hallelujah! As a side note, is it not ironic that those who refuse to deny themselves and suffer for the sake of Christ and his word, have no trouble denying their natural, God-given desires to be with their own kin, all so they can score points of political correctness and enjoy the praise of ungodly, Marxist, haters of God? Anyhow, a little off topic, but I want to mention this. I realize that my blog is the essence of controversial and of that which is bound to be hated. I accept that. My goal from the beginning has been to tell it how I see it, from my viewpoint, with what I believe is scriptural and Christ-honoring. God has blessed me (although sometimes it feels like a curse) with an "I don't care what man thinks" attitude and I typically do not mind going against the grain. I wish to honor Christ alone and I have no loyalty to anyone or any thing; not to any doctrine or belief: nothing above the truth of God's word. So I will oppose Kinists when they oppose the word of God. And I will oppose the Reformed when they do so. I will oppose the Anabaptist, and the nominal Christian alike. I want to believe the truth and honor Christ. But understand that I love you true Christians dearly, even if you disagree with my writings, beliefs, and practices. And I will sacrifice myself and lay down my life for you. I will die that you may live. I will lose that you may win. I will suffer that you may be blessed. I have major disagreements on every side, with every kind of Christian there is. And there are not many that believe that the old paths are the right way to go to the extent that I do. Because of this I have enemies at every turn in my life. But if God is for me, who can be against me? I want to encourage you all, to not let your disagreements cause you to hate your brothers in Christ. I see it happening on both sides of the Kinism vs Alienism debate. And I see it happening in many other groups of Christianity. I am NOT promoting that we embrace those who hate Christ by their actions and words. But when you have wholehearted Christians that love Christ and obey his word, there should be love and fellowship. Let us have conversation in godliness, without strife, envying, and pride. Let us truly honor Christ in how we love one another. 7 "Beloved, let us love one another: for love is of God; and every one that loveth is born of God, and knoweth God. This is an amazing statement and arguably nothing can be more important for Christians to understand in the generation which we live. I praise God that he brought to my remembrance this book. I had given the book away to someone else years ago, but when I remembered it once again recently, I ordered in online (only $3.00 used, praise God). I will not cover everything he covers (I hope to make this a short post-- hope!) but I do strongly encourage you to get this book and read it, and meditate on it. If not, I hope you will at least take the encouragement that he offers, which is, to study the life of Jesus in light of his humility, and to study his teachings on humility, and the teachings on humility in the scriptures. How can we consider a little practical application of the principle of Luke 14? Taking the lowest room can be applied to every area of your life. It is a principle to live by. It is sort of like the example of Jesus running away from the crowd when they wanted to make him a king by force (John 6:15). We should continually seek to deflect all honor and praise away from us, onto the Lord Jesus. And when opportunities present themselves (because certainly you will be tempted) for me to be the center of attention, for me to "steal the show", for me to stand out above my peers; when these things happen, we ought to at least proceed with extreme caution. Do I desire to speak the great words that will cause a sinner to repent, or am I more pleased and more blessed, and yea, more inclined to desire to be that hidden prayer warrior that nobody recognizes, and nobody will ever give thanks for? What is my reward? As Keith Green puts it in his Christ honoring and spot on lyrics (as always) in "O Lord, You're Beautiful", My reward is giving glory to you [the Lord Jesus]. It is natural to want to receive a pat on the back, or some sort of recognition. We want to feel important, valuable, and needed by others. We want others to know that we really are good Christians. But are we willing to lay these desires on the alter of sacrifice to the God of heaven, willing to be nothing, so that Christ may be all? Do we have to get the last word in on a discussion (I say discussion because a Christian should not engage in a debate-- a debate is one of the works of the flesh-- Romans 1:29, 2Cor 12:20), so that everyone knows that I am right and he is wrong? Would you rather tell a whole lot of people that you are praying for them (so that they think how loving and kind you are) or would you rather secretly pray for that person and have them be blessed. Recently I was attending a church prayer meeting, and if you know anything about the typical church prayer meeting in the good old USA, you know that almost every prayer request is for some health problem someone is having. I am not against praying for health problems, but really, that is what the prayer list is full of; that and "traveling mercies". And again, I am not against praying for those things. But, really, when is someone going to stand up and say, "Please pray that God's name would be glorified in our land. Please pray that God would be glorified in our church and make us a testimony and a witness to our communities." When is someone going to be grieved in their heart about what they see going on around them? When is someone going to get a vision for God truly working a work in our land, and pray about it, and not let go of the Lord until he moves mightily? I guess a little background is due before I tell the rest of the story. We have been attending this church consistently (although not every single Sunday) for over a year now. We are not members. We have a few disagreements doctrinally with the church, but we would not have a problem being members if we were asked to be. I have a bigger problem with some of the lifestyle and practical decisions of the members and Pastors than I do the doctrine, but that is a story for another time. Anyhow, we typically do not attend Wednesday night prayer meetings. So on the rare occasion we are there, I do not feel particularly qualified to lead out in prayer. Combine that with the fact that we are not members and I doubly feel unqualified. In my days of youthful pride, I would have wanted to come in there, and pray for those things that I believe are severely lacking in their prayer meetings; in order to wake the people up, to stir them up, or to show them what real prayer is like. Can I pray better prayers than they can? Are my prayers of more worth? Maybe, but that is not really the point. The point is that God wants me to humble myself and trust in his providence. He wants me to see his hand working through my private prayers. He wants me to stop trusting in my own wisdom, in my own power, in my own words and persuasion, to change these people for the better. Too many times in the past I have tried to change or even convert people by my own might, and God has made sure that it never happened, at least as far as I can see, to teach me humility; to teach me to rely on his power and his grace alone to convert or change someone. My problem has always been that I have not trusted God enough to believe that he can and will change someone. So back to the story: Here I sit in the prayer meeting with all these thoughts running through my head and even frustrations at the others (which I do not repent of, because I am grieved legitimately at the lukewarmness that I see around me). The lead Pastor stands and calls for us to pray and he specifically, but discreetly hints that he wants me to pray as he looks in my direction. I know him well enough and know people well enough to know what he was doing. And this combined with a conversation I had with him at the New Year's Eve prayer meeting, I was sure that he was hinting at it. And I know why he was doing it; despite his flaws, he is a very loving, caring person, and wants to make sure that I know our family is included and accepted and loved. He has a shepherd heart. I bless God for him, and bless him for being that way. Did I take that opportunity that God seemingly placed in my lap? Certainly I would not be sinning by doing so, but I took that as an opportunity to humble myself and pray secretly. I have an unction that perhaps if I had prayed, I would have developed a proud spirit shortly after. Do we want to bring forth much fruit, or are we content with shallow, same old, same old, Christianity, just going through the motions? Some things are not necessarily sinful if we choose to do them, but we should not do them anyway because they are not expedient or profitable (1Cor 6:12, 1Cor 10:23). And every situation is not the same. We need to learn discernment from walking with Jesus and knowing the voice of the Holy Ghost. But if you are going to err, then err on the side of denying self, and humbling yourself in every decision. It is a learning process we all need to grow more in. The more we do so, the more likeness of Jesus Christ will be in our lives. But The Bible Does Not Say Women Cannot Wear Pants!! A long time ago, far, far away, there once was a time when Christian thought and practice dominated a good part of the world. White Christian Europe, imperfect as it was, was a vast area of land that brought glory to the Lord Jesus in many ways. If you can flush out all the lies and extreme over-exaggerations that the Marxists taught you through the public schools, the media, and the 20th/21st century church, you would view old Christian Europe in awe; of the beauty of the holiness of the LORD it displayed for many years. Jesus always got to the heart of the issue. A Pharisee may have prided himself in technically obeying the law; but he did not keep the spirit of the law. Perhaps he did not murder his brother, but he murdered him in his heart with his hatred and unforgiveness (Matthew 5:22). He might also have thought he was okay because he did not physically commit adultery, however, he did so in his heart (Matthew 5:28). The same holds true in the area of a woman's attire. Yes, you are not "breaking the law", perhaps (although it is more arguable than I am letting off right now- for the sake of argument). But you are committing a whole slew of spiritual violations of that which is becoming of a Christian woman. 1) Those who live by the letter of the law: They try very hard to make sure they are not breaking any of God's commandments. They do not necessary live a life of sin. But the spirit of their life is this: I am going to do my own will, and whatever lawful activities that will please my flesh. As long as I keep myself from breaking a specific command, I will do as I please and live a happy, comfortable life. 2) Those who live by the spirit of the law. They do not live to please themselves. "I can of mine own self do nothing... because I seek not mine own will, but the will of the Father which hath sent me." (John 5:30) -- meaning, I do not just act and make decisions based on what I want. I seek to do what the Father is telling me to do, and seek to do what pleases him the most. He is looking to do what pleases God most, and what glorifies God most, not to just avoid committing a great sin. Apply this principle to the area of women's dress. Do you really believe it most honors God for a woman to wear that which has only pertained unto a man (until society became practically entirely corrupt by the spirit of the world, and the influence of Satan)? Is the reason you are wearing pants, woman, because you want your life to give the most glory to God, as much as possible? Or are you wearing them to be comfortable, or because you have so-called "liberty"? There is more than one way to use your liberty for an occasion to the flesh. You can use liberty to please your own flesh, yes; however, you can also use your liberty for an occasion to your brother in Christ's flesh. And thereby you have created a stumblingblock. "I know of many women who wear pants that are much more modest and less revealing that a lot of women who wear skirts and dresses only". And.... what is your point? That is like saying, "I know a lot of Atheists that are better people than a lot of Christians", to prove that Atheism is morally superior to Christianity. I would make a case that it does not matter what kind of pants you wear, you are going to be in violation of the spirit of the scriptures. Never mind that almost every time a woman defends herself wearing pants, she is wearing pants that reveal her shape. It is almost not possible for a woman to wear pants that do not reveal shape; the ones that do not reveal her shape are not feminine, therefore in violation of Deuteronomy 22:5. It is almost as ridiculous as those who argue that long hair is the head covering spoken about in 1Corinthians 11; many of those who argue that position, their women do not even have long hair! But I digress. The way you dress affects your own attitude and behavior. It also affects other people's attitude and behavior toward you. This is a fact. That is why men dress up a certain way when they have a job interview. Your clothing is a mirror of your heart's desires; how you want people to view you. And people do view and judge you (and they usually judge correctly) based on your clothing choices. I do not believe I need to prove this. The children of this world understand this truth all too well. When a woman wears a dress or skirt (one that is not revealing, but rather shows forth shamefacedness, meekness, etc., as the Bible commands) she is viewed differently by the public. My wife takes careful note at the respect and honor she receives from men when she has to go out in public to shop. She dresses like a lady and therefore is treated like one. It is also true that when a woman dresses like a lady, she feels like a lady, and therefore, behaves like a lady. We have seen the vast difference in attitude with some former Amish that we know: Upon believing the gospel and being saved, they came out of the Amish. Afterward they did not dress all too that much different. The church we belonged to held up a similar standard as the Amish do, except, without the extreme immodesty that the Amish possess in going overboard in plainness. But then, after the church dissolved, they came across the teachings of a man who preached against the law, and against outward standards. He told them that all that mattered was their heart. After a few years under such doctrine, the women have bleached blond shorn hair, tons of make up, jeans, etc. And even though it may not have affected their character immediately, the change in their attitude today is obvious. They are completely in love with the world and all its desires (1John 2:15-17). And you can see, as always, that the devil's doctrine of "the only thing that matters if the heart" leads to compromised outward standards, which in turn lead to a corrupt heart; all the while, even though the heart is changed to wickedness, these "Christians" continue in the mantra that "only the heart matters", so "don't judge me". Women who dress like men, act like men. The women you see wearing pants, they are typically the ones you see who are not submissive to their husband. They do not have a meek and quiet spirit. They do not adorn themselves with shamefacedness and sobriety. I frequently talk to husbands, who tell me how much they want their wives to dress like my wife does. And they lament that they have tried to get their wives to do so, but their wives are unwilling. The unsubmissive character of these women goes hand in hand with their ungodly attire. Women are absolutely effected in their attitude and behavior negatively because of wearing pants; but most of them do not even realize that an outward decision can have such an effect on their attitude. It happens without them having to even think about it. This is a universal principle; your clothing choices will change you for the good or the bad. Those who deny it are akin to those who deny that their music and entertainment choices effect their behavior and way of thinking. It does effect you, and that is a fact. Saying that women are permitted to wear pants publicly just because the Bible does not explicitly spell it out, is a ridiculous way to view practical application of scripture. The entire way of thinking is a logical fallacy. It is almost the same as saying, "There is no Trinity because the Bible does not use the word Trinity." Every doctrine or principle in the Bible is not always spelled out plainly in front of your face. In fact, many important doctrines are not. That is why there are so many false versions of Christianity, and so many ungodly and unbiblical doctrines that prevail; it is precisely because God hides the important truths of his word from those who seek their own glory and those who seek to live for their own pleasures. They have the spirit of self-gratification, and their doctrine follows. So it is in the area of women's attire. And just as we spoke in the previous article (on attire) of the man who wears the fancy suite and tie, and how we know he is not doing that to glorify God, similarly we know that the woman who chooses to put on pants instead of a long skirt or dress, she does it not with the motivation of "I want to glorify God". She does it because that is what pleases self. And we know that you do not have to do some horrendously wicked sin to be disobedient to the spirit of the gospel of Jesus Christ. You simply have to live a life of doing what pleases self (rather than living to die-- to deny self). And I hope that you have the Christian maturity and experience to understand that I am making a general principle statement, and not speaking on behalf of rare exceptions. The possibility of an exception does not establish the exception as the rule. But we live in an age where every person thinks they are the exception to every rule. 4) Women both view themselves and are viewed by others differently based on whether they dress like a Christian lady, or whether they wear pants. 5) Women's attire follows precisely with the spirit of the age. The more society departed from the word of God, the more women adorned themselves in a way to please self and draw attention to themselves. Women turning to pants (after previous generations of women sinned in attire in other ways) corresponds directly with their rebellion in leaving the home, becoming independent, and despising the word of God. This is no coincidence that they occur at the same time. This does not even consider what should be obvious; that a woman should not wear a single layered garment (especially on her top) that reveals her shape. And please remember what we discussed in the previous similar topic, Glorifying Jesus in Attire; we should not be making any decision to draw attention to ourselves rather than to Christ. Let the church repent of sin and lukewarmness, and let us see the Lord Jesus Christ glorified in the midst of us once again. When I first started up this blog, I had the goal of having many short posts, and a variety of topics. I just wanted to give Biblical opinions without having to write long articles, "proving" every detail. But so far I have just written articles. Ugh! The writer in me does not know how to just write a blog post! But I will try to make this short... but I can not promise anything. Here we have a picture that you should be familiar with, if you were saved and entered into any kind of evangelistic church. It's a Chick Tract. What is a Chick Tract?, you might say. It is a gospel tract, but a comic book version of it. I used to use these things all the time. I used regular gospel tracts a lot too, when I was in the Fundamental, Independent, King James only, Bible-Bashing Baptist Church. These tracts get read a lot more often than other tracts, as they claim. They are pretty interesting. I used to think very highly of them when I was first saved 14 years or so ago. 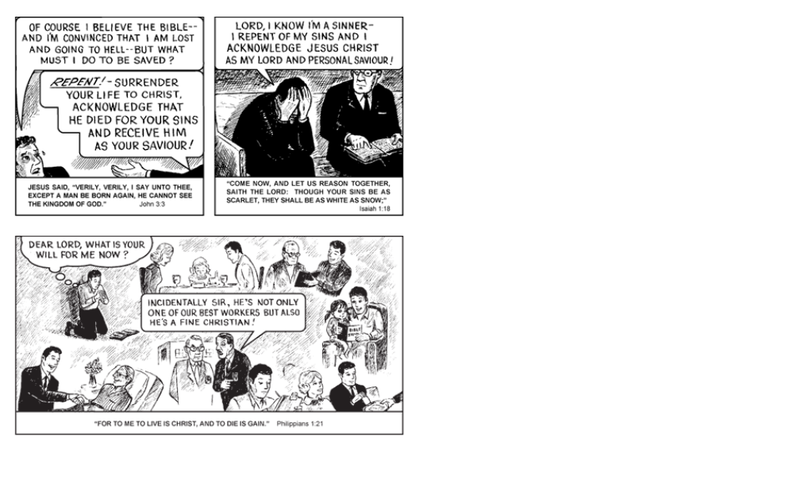 But, This Was Your Life, I have concluded in my Christian Maturity, is the only decent Chick Tract that Chick produces. All the others are horrendous because of a few different reasons (and I won't name them all here). All the of reasons I hate most Chick Tracts now, are the reasons that I probably loved them when I was an immature Christian. It is a major shift in worldview. As a Fundamental Baptist, the only thing in life that matters is getting people saved. And because God was not sovereign to us, it was up to us. If you passed by anyone without giving them a gospel tract, their blood is on your hands for eternity!! Anyhow, because the only thing that mattered was getting people saved, almost all of the Chick Tracts have a story of someone getting saved just before they die. So the moral of the story is... make sure you don't die before you get your Jesus insurance. You don't want to go to hell now, do you? Get saved so you can live happy in heaven and so you won't suffer in hell. That is the message of Chick Tracts. The difference is the weight of emphasis. Even though Chick teaches discipleship a little bit, his mind would be at ease if the whole world were "saved" and went to heaven, even if none of them actually lived to glorify God on the earth, and made an impact for his name. The difference is between a man centered gospel and a Christ-centered gospel. But I guess what do you expect from a Dispensationalist who thinks all of the world's problems come from the Roman Catholic Church, and who worships the Jews and Israel? All that to say, that one Chick Tract that is actually decent; it's actually pretty good and effective; "This Was Your Life", is a simple gospel tract, but with the bonus that the main character in the story, when he gets saved, it's not on his death bed so he just escapes hell, but rather this tract actually shows the man living out the Christian life, bearing fruit, living for the glory of God and of Christ, before he dies. After my imbalanced days of giving a gospel tract to every person I saw, or at least leaving them around at places, I went on the opposite extreme and did not give out any, nor really seek to convert many people. After several years God is starting to rebalance me a little (not just in this area, but other areas as well-- praise God). So I ordered our family four 25 packs (total of 100) of "This Was Your Life". I am going to start leaving these around at a few random places, not too aggressively though. Some at work. Some at the stores. We'll see where it goes from there. I definitely do not recommend any of the other Chick Tracts (well, maybe the one called "Big Daddy"). But if you want to be entertained on just how wildly out there Jack Chick is on his ridiculous Baptist beliefs, you can visit chick.com and read all of the tracts online for free. In the mean time, I am going to go celebrate that I actually wrote a short blog post... and will be in prayer that God uses these tracts as a way to bring people unto himself, and thereby Christ Jesus being glorified in this land.